A monument erected in 1935 by the International Society of Sugar Technologists, commemorates the pioneers of the sugar industry. 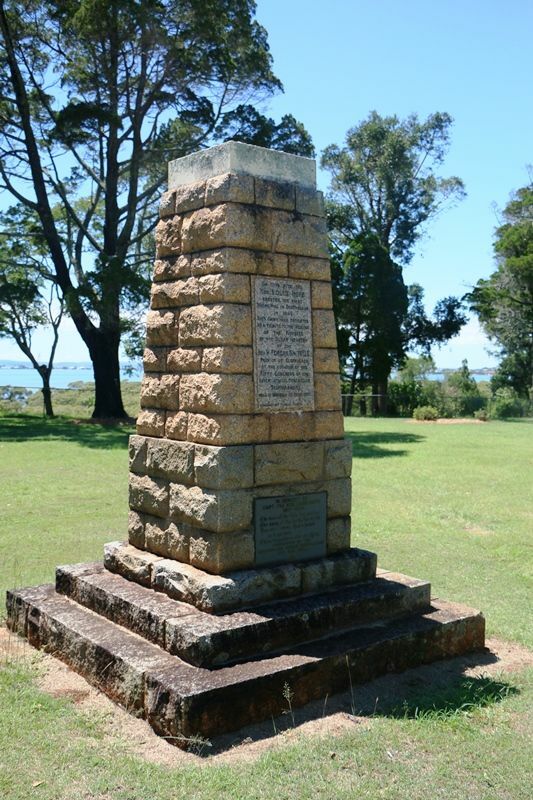 The cairn was constructed of granite from the three important sugar growing areas around Cairns, Herbert River and Giru. Louis Hope became a major figure in establishing the colony's sugar industry at Ormiston. Some twenty acres (8 ha) were put under sugar cultivation with Kanaka labour from 1865 onwards. He had a mill built and in 1864 produced three tons (3.04 tonnes) of sugar and fifteen cwt (762kg) of molasses. He supplied plants for the several experiments of John Buhôt and cuttings for plantations in the Oxley district. He also advised another sugar pioneer Claudius Whish. 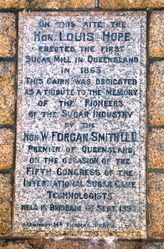 The unveiling of the memorial cairn at Ormiston, the cradle of commercial sugar production in Queensland, last Sunday, in the presence of representatives of the principal cane-growing the world, was the expression of a happy thought and a graceful tribute to the memory of the pioneers of the sugar industry in Australia—an industry which has justified more than the faith and of its founders. When Louis Hope planted his 20 acres of cane at Ormiston in 1862 did he realise that he was doing something more than beginning a successful commercial enterprise, that he was founding an industry that was to make the chief contribution to our tropical lands? The cairn at Ormiston on the site of Queensland's first sugar mill to th pioneers of the sugar industry will remain, as a fitting monument, and — in its significance — something more than amaterial landmark in our agricultural history. The Queenslander (Brisbane), 5 September 1935. Hon. W. FORGAN SMITH LL.D.